Tonight at 20:00 CET we're coming to Kickstarter Live! We'll be joined by Loulou, our incredible scenario writer, for a Q&A session. That means the three of us will answer all your burning questions live on stream. You can ask them in the live chat then, our you can send them our way now so you can be sure we won't skip them. We just made our first social stretch goal: 50 retweets for our announcement on Twitter! That means we'll be adding Correspondence Mode to Epicinium: an asynchronous multiplayer mode where you can play lots of matches at the same time with time limits of hours or even days. This gives you plenty of time to ponder each order, and also to live life in the meantime. Next stop: 100 retweets for Chaos Mode (16-player multiplayer). Our Facebook announcement needs only 7 more shares (don't forget to set the visibility to 'public' so we can count yours!) to unlock Battle Royale mode, where you'll fight your opponents on a shrinking map, upping the intensity as the match goes on. Also be sure to join our Discord so you can chat with us, have your feedback heard and get a voice during the development. Epicinium is a game of balance. We handcrafted lots of checks and balances, positive and negative feedback loops to make its gameplay interesting and fair. We talked about this in our community match video. Here, we mentioned the limited number of new orders per turn as an example - your army can become so big that it becomes uncontrollable, allowing your more versatile opponent to take advantage. Another example is in the environmental gameplay mechanics. 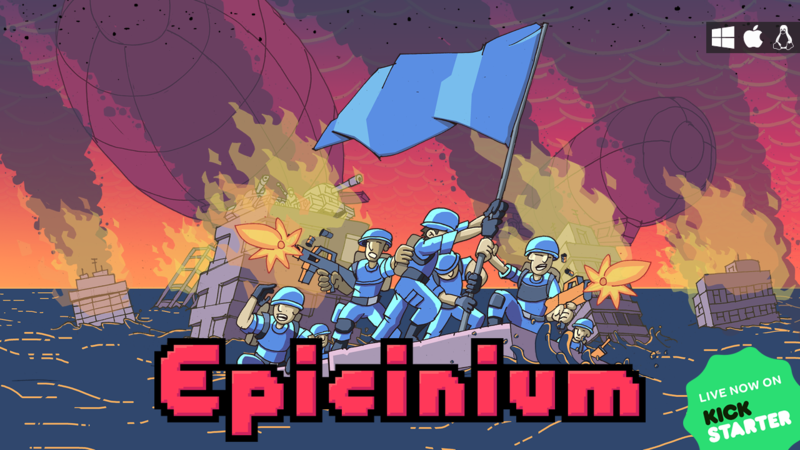 In Epicinium, the victor is scored for how much nature remains when the dust settles. At the end of a game, all the remaining grass and forest tiles are tallied up, and that number is given as points to the winner, contributing to their competitive rating. This way, the game map itself is a giant score counter. This lends extra weight behind all the decisions you make in a game of Epicinium. Every bullet hits something. Every enemy city you destroy is a city you can't claim for your own. Building lots of industry will give you mad income and allows you to purchase tanks - destructive war machines that will dominate the playing field - but also makes those devastating weather effects like bonedrought and frostbite commence that much quicker. Every grass tile you trample with your tanks near the enemy's cities prevents those cities from growing - giving you an economic and military edge, but also one less point when you do win. This adds depth to Epicinium's gameplay, not by punishing the player for a certain play style, but instead by adding additional considerations and challenges to each one. A new player might be unaware of most of these mechanics and might not care - they just want to win! Losing gets you zero points, after all! They go all-guns-blazing and pump the map full of industry and tanks, fill every nook and cranny with farmable soil for that extra income, and this might even work! Despite their inexperience, they will win lots of matches, even against more experienced players who opt for more eco-friendly, but slower, strategies. However, they won't get very many points from each match, causing their rating to increase, but remain relatively low. If this new player wants to improve their rating further, they will need to learn how to win the game with more points. The balance is delicate, because giving up that much firepower might cause them to win less often, but really, do they need that much firepower to win against most opponents? But even among the higher rated players, who might go for a green strategy from the start because they need every point - they've got a high rating to uphold after all -, there is the continuous temptation to deploy a few tanks anyway to give themselves an edge against an unsuspecting opponent. I had originally written more about this, illustrating the point further by comparing different types of Epicinium players. However, I'll save that for the next devlog so this doesn't get too long. But I have to stop here and save them for another update - you already read through a wall of text (congrats, you made it! whew). If you're reading this and made it this far, you're likely interested in Epicinium and maybe pledged already, or are considering to. We're extremely stoked to have you on board with us on this journey! Back the project, share our posts on social media, and give your personal recommendation to friends. We are only able to finish Epicinium with your help. I'm convinced that together, we'll get there! We'll speak with you on the livestream tonight. Don't forget to send us your questions! Take care now.